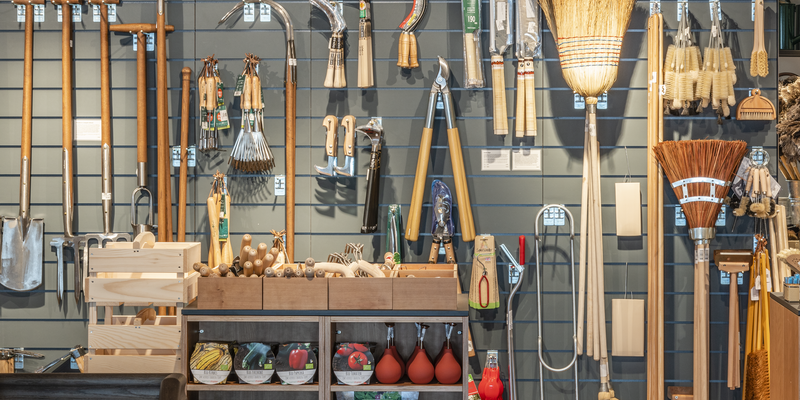 Manufactum has opened its 10th department store, the first in Austria. In the landmarked building at the top address "Am Hof" in the first district in Vienna, a space was created after the renovation, that not only shines through its diverse products: as exceptional as the product range is the interior, designed by umdasch. Looking for a case for the Canadian folding saw? Or slate cufflinks? Eye care for dogs, or rather reindeer leather gloves? If you are looking for products that make everyday life more beautiful, you will definitely find what you are looking for in the new Manufactum. 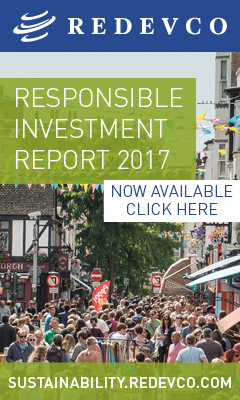 The offer ranges from household utensils to foodstuffs to clothing – all sustainable, high-quality and special in every way. Even an in-house café offers intact, original goods and differs significantly from comparable departments.The target group is also a colorful mix: young people, managing directors and eco fans are browsing each other’s assortment. “High quality & exceptional products that work well, last a long time and get repaired. Manufactum — department store of good things. “, is Manufactums understanding of sustainability. And it is precisely these good things that are now also available in the middle of Vienna — in a location that sets them in the limelight. The significant building at the central address “Am Hof ​​3-4” in Vienna was built in 1912 by the architects Emil Hoppe, Otto Schönthal and Marcel Kammerer. It captivates already on entering through the three-meter-high entrance door. Immediately an impressively created spatial experience beguiles: a ceiling section connects the upper floor with the ground floor optically, high panorama windows provide natural light as well as a breathtaking view of the inner-city bustle. Cast-iron pillars point to the history of the building, which was built by the “Zentralbank Deutscher Sparkassen” more than a century ago. The space on 800 sq m thus provides the ideal setting for the staging of over 6,000 items. The expectations which the department store places on its products also applies to the furnishing: versatile, extravagant and solid. The interior was developed by Schwitzke & Partner, the long-standing design and architecture office of the department store. 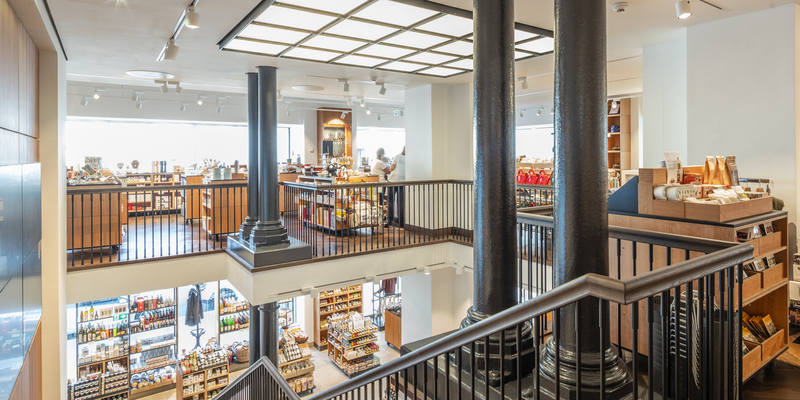 The idea behind the design of the new store was to preserve the found historical substance as much as possible. “The relation to the city of Vienna should be recognizable in the space and be carried over the materiality. 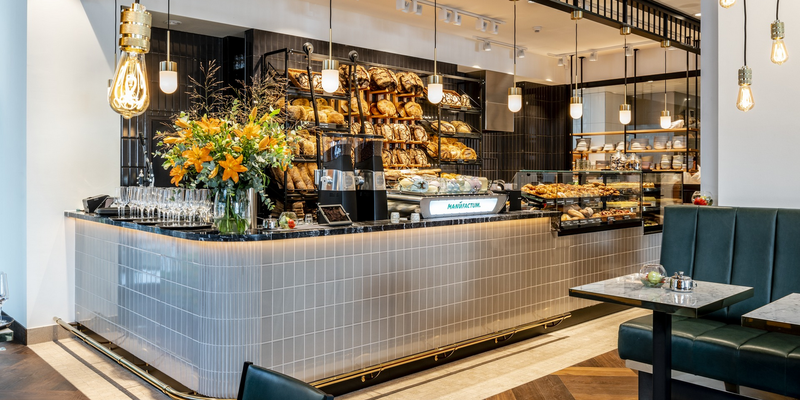 In addition, the interior design challenge was uniting the department store and the café together under one roof atmospherically”, explains Tina Jokisch, Managing Director of Schwitzke & Partner. For the Manufactum in Vienna, the experts from Dusseldorf chose a floor made of dark smoke oak as a contrast to the cherrywood display units, and leather and brass elements cite Viennese chic in playful furniture details. For the first time for Manufactum, umdasch The Store Makers was responsible for the shopfitting. The focus here is on the fine workmanship of the furniture: seamlessly the cherry veneers close their joints, precisely shaped metal parts in black steel look in combination with the wood make a rustic, cozy and at the same time noble impression – just like the city of Vienna. In addition, a video wall, consisting of four screens, each with a 55-inch screen size, is applied. “Not only the opening of the first foreign branch is a novelty for Manufactum. The store in Vienna is also the first to be equipped with digital signage”, explains Franz Kendler, project manager at umdasch Digital Retail. The furniture of the dining terrace, which is part of the café, was also produced by umdasch: cherry wood paneling, green quilted leather seat benches and targeted brass applications invite you to linger. Specially made benches made of robinia wood and generous plantings also ensure the cozy atmosphere. “Vienna is one of the most important metropolises in Europe and the second largest city in the German-speaking area. 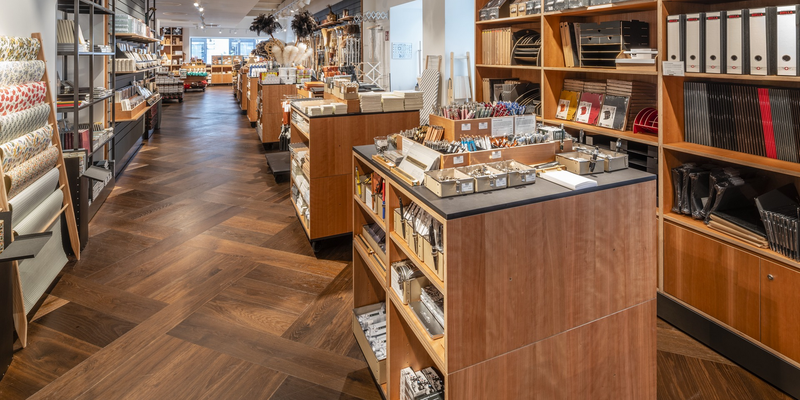 We have already gained a loyal customer base in Vienna and in the whole of Austria through our online shop and our catalog to get to know the stationary advantages and the special shopping experience of a Manufactum department store”, explains Max Heimann, Managing Director of Manufactum.